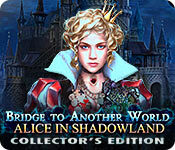 Bridge to Another World: Alice in Shadowland Collector's Edition is rated 4.4 out of 5 by 81. Rated 5 out of 5 by Joeysie85 from Amaingzly Fun I dont have much to say about this game other than it was completely fun! Rated 5 out of 5 by dustylee from Best game I have played in a long time! I judge games on several criteria: graphics; music; complexity of puzzles; and (least important) story line. I do not really care for bleak, dark games, but really enjoy the fairy tale style games when they are developed for adults. The first game that really "caught" me was "Drawn" and I loved the remainder of that series. I am always looking for something that has a similar look to those games: beautiful drawings/graphics and a hopeful/friendly theme. Alice in Shadowland met all those criteria and kept me completely captivated throughout. Also, it is quite a long game so there was plenty of time to become immersed. I hope to see many more games of this quality in the future. Rated 5 out of 5 by RAZZYJAZZY from ONE OF THE BEST! I love the Bridge To Another World series, and this? THIS? AMAZING! They really out did themselves. You are immediately sucked by this games beautiful art the minute you click PLAY. The characters we traditionally know are different and its wonderful. What is so funny is that the Cheshire Cat is a man, The White Rabbit is also a (human) man. The original author of Alice in Wonderland based his characters on real living people and the truest film version of Alice came from the BBC in 1966, in which the characters are unmasked (so to speak) and look human. Anyway, BUY THIS cuz once you play the demo you'll TOTALLY PLOTZ! Rated 5 out of 5 by Buffy48 from Awesome Game! I have not played a great game like this in a long time.. Rated 5 out of 5 by pennmom36 from I'M LATE, I'M LATE, I HAVE AN IMPORTANT TEA PARTY TO ATTEND, THERE'S NO TIME TO WASTE! Alice was distracted by a large red top hat adorned with playing cards, laying on the road, when she was taking an evening run. Curiosity got the best of her so she stopped to get a closer look, but this turned out to be a very bad decision. Alice is broadsided by an old man who pushes her over the bridge and into the river below! Alice panics and grabs the first thing she sees, a mirror shard that swooshes her into a portal of Another World! This isn't the Wonderland that Alice discovered in the fairytales, this is Shadowland, and the old man is none other than the white rabbit, well Rabbitson, to be more specific. Things go from ugly to worse when he realizes he has the wrong Alice, this Alice isn't the one the prophecy awaits to save Shadowland, and the Princess of Hearts has put a price on her head! Just when you think things couldn't get worse, Alice's very own shadow is taken, and without your shadow, you cannot survive in the real world, Alice can't go home without her shadow! What a fantastic twisted fairytale! This game is awesome, and you can't help but think about the good old days when you were a child. I remember watching Alice In Wonderland for the first time, I thought the Cheshire Cat was scary with those humongous teeth, nobody told me he was a grinning kitty at the time! I have to give kudos to the devs, this is thinking outside of the box, this is genius in the making and they should recognized for their efforts! Alice will find some very useful devices along her journey to recover her shadow, among them is a very special Watch. This watch is used to transfer from your body, into your shadow , and back using the hands of the clock. (this part didn't make sense to me, how does she transfer into her shadow if the Bandersnitch stole her shadow?) Alice also briefly uses a special Compass that helps locate lost items but only when used with another item connected to it. The compass will reveal what happened when you move the compass around the scene and click on the matching image as shown. Several of the scenes have a Panning Feature that allows you to pan the scene right or left to create a broader range. This Collector's Edition also has the usual Achievements to earn as well as 31 Morphing Objects and 37 Collectible Playing Cards. Each Scene may contain more than one of each object so there are pull out tabs on the left of the screen that will tell you how many cards and morphs are available in each location. I found this feature entertaining and was enough to persuade me to purchase this Edition over the upcoming Standard Edition. 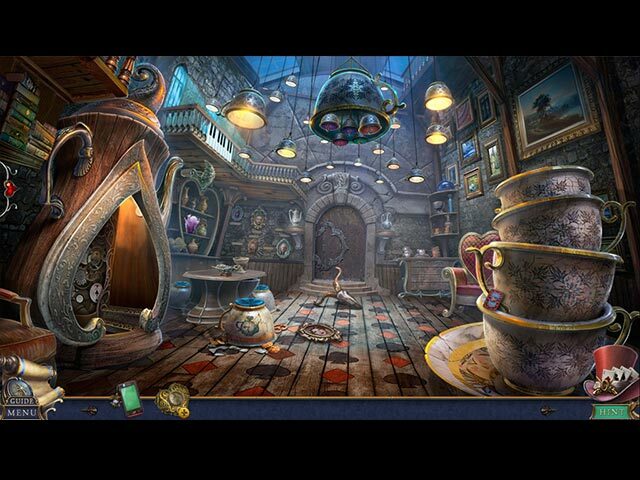 The Hidden Object Scenes are really well done and had interesting locations as well. There are Interactive List finds, Keywords to find in a story and one of my favorites was finding several Metal Alphabet letters. The Mini Games are numerous and varied with a mixture of super simple puzzles to lengthy more complicated games. Below are brief descriptions of some of the games you'll encounter during the demo. I'll include more on my review of the SE, from the main game as I complete the adventure: 1) Click to open two roses at a time to match identical colored flowers. 2) Arrange the photos for each step of the kidnapping plan. 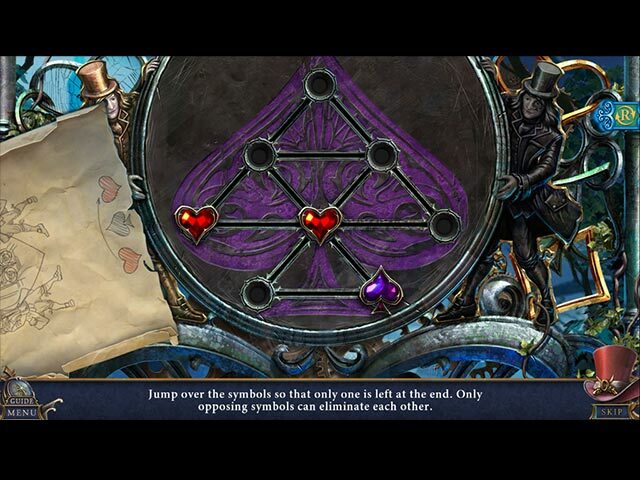 3) Jump over the symbols so that only one is left remaining, only opposing symbols can eliminate each other. This puzzle is repeated with 2 more games that become increasingly more difficult. 4) Click on different components of flower arrangements on a horse statue to change the arrangements to mirror the clue shown. 5) Find the objects shown on Alice's Compass to reveal what happened by moving the compass until the necessary image is visible and clicking to select the image. 6) Grab strong ropes, toeholds and icicles to help Alice climb the cliff safely. 7) Touch the spots in the correct order to recreate the symbol, if you choose the wrong one you'll have to start over from the beginning. 8) Trap the spider by removing the web hexagons blocking it's way, the spider can only move to neighboring hexagons. 9) Use the clues to traverse the maze, choosing the paths based on the statues shown on your phone. 10) Remove all the symbols from the shield by selecting and dragging a chain of 3 or more identical adjacent tiles in a Match 3 variation game. This Collector's Edition has 15 replayable Mini Games, 12 replayable Hidden Object Scenes, 13 Wallpapers, 4 Screensavers, 15 Concept Art pictures, 5 Music Soundtracks, 52 Movie Videos, 31 Morphing Objects, 37 Collectible Playing Cards, 20 Achievements, a built in Strategy Guide and a Bonus Chapter, enjoy! Rated 5 out of 5 by cl1960 from One of the best in a long time! Finely! I was really getting bored with most of the games I have been playing. All they seem to be is finding objects to find more objects, uninteresting puzzles and 2 or 3 actual HOP. This game has a great balance of all of it. I can't say enough about the quality of the story and games involved. I will be looking for more games from this developer. Great game! Rated 5 out of 5 by cuddlebug0 from Thank you BF for this release! This is not just another fairy tale, but it is a refreshing change from the very same old, tiresome witches or demonically themed games. You have just the right mix of challenge and ease of choice in game play levels. I am so happy to finally find a game that is worth buying. I loved everything about the game. The mood created, the delightful characters, and the music. Images and colors were spot on for this game. I am so hoping for additional releases on this level. For those of us who do enjoy the more "twisted" fairy tale games, this one is great. Rated 5 out of 5 by jazeribe from Five Star Game Never left a review but this game is sooo good. Love everything about it. My game of the year so far. Rated 5 out of 5 by woody1050 from Best game I've played this year Absolutely brilliant game. Couldn't stop playing it. Sorry to have finished it. Will download all the others now. Highly recommended. Bigfish you've done yourself proud again. Rated 5 out of 5 by LadyHawkMT from Unique and Challenging! I have played a lot of games relating to fairytales and I do believe the take on this particular story was different and unique. Being Alice, then rescuing her daughter in the bonus chapter as the Cheshire, was to say the least a neat take on the story of Alice in Wonderland. You even get to shrink! The scenery was both colorful and eye-catching. Even without the map finding your way around was easy enough although I confess I did use the map at times. HOS's were both challenging and interactive, you even had zoom in scenes. The mini games were variable in degrees of difficulty which was nice because it keeps you moving through the game at a nice steady pace. Collectables were something I was determined to find and I did. Chasing your shadow and trying to reconnect to it then returning home with a hint of what's to come in the shadow when it waves at you and Alice isn't waving, leaves you looking forward to the next release in this game series. Great job! Rated 5 out of 5 by codom from My Hat is Off to the Dev I'll add my two cents to the reviews and say that the devs did an outstanding job on this game. I don't review the story-lines in games but this is a nicely-done, original take on a classic tale. Graphics and VOs were very good (not spectacular). Each time I stopped playing, it was really hard to pull myself away, which is quite rare with most of the games here these days. If I had one complaint it's that the puzzles could have been more challenging...but, really, the game was so good that hardly mattered. Rated 5 out of 5 by Italia47 from The Shadow knows!!! Or is it the Bandersnatch that knows all? Hmm, a different take on Alice in Wonderland, for sure! I'm almost finished with the main game of this CE version. And if you choose a more difficult level, there definitely won't be any hand-holding, which I like actually prefer. With that said, at first I found this game to be a 'scattered brain' gameplay because I had to think real hard on what next to do and what to look for in a couple of the HOPS--trying to figure out the method of these developers' madness. I was beginning to think they were all Mad Hatters at one point! I'm rating this game a low 5-star, nonetheless. There are some quirks in this game, whereby I had to click several times to get things rolling but once you get pass that point it's really good. The music is not bothersome and I've heard it before. The sound effects are good. The voiceovers are very good. Since you're in Shadowland, Alice's voice sounds as though she is in a tunnel. But her voiceover is quite good. I very much enjoy playing the puzzles and mini-games and there are loads of fun things to do, so much so that you may tend to forget to pick up the cards and morphing objects along the way. But there is a pull-out tab to your left that will tell you how many cards still need picking up and how many morphing objects to pick up as well. I love how this game is laid out by these developers, too. Bravo, devs! Throughout the game you will come across a virtual panoramic view on some scenes--click arrow to go all the way to the left--to the right, etc. I love the fact that this game had a modern take on using a cell phone to take pictures that are necessary to move forward and to also use the flashlight feature. Pretty cool! Of course, the reception in Shadowland is all but naught. So forget about making or receiving calls. In addition to the phone, you will need to use a compass. I'm really digging this game and am finding it to be an intriguing story. I'm glad I purchased it. The artwork is very good but cartoonish, and the movement of the characters can be rather stiff.The colors are bright and harsh at times. But the graphics, on the whole, are good. I definitely recommend this game. Enjoy! 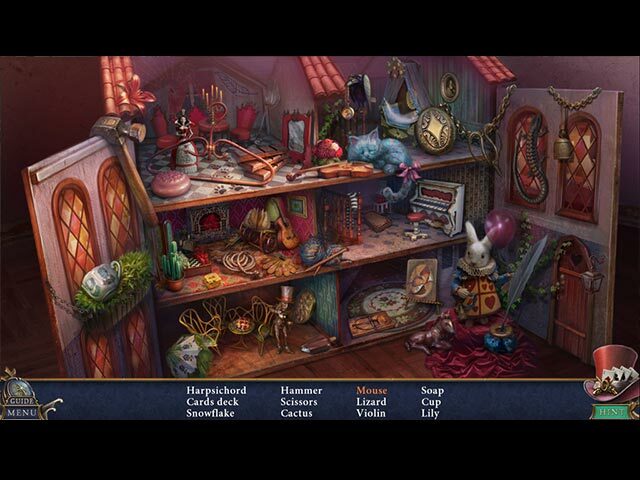 Rated 5 out of 5 by Maniactree from Best Hidden Object Game Wow, I absolutely loved this game! There was so much to do at every level. Make sure you click on objects along the way. The attention to details from these devs is terrific. Bravo! I wish all games were this good. Rated 5 out of 5 by Bunny1419 from Best game in a looooonnnngggg time! I never post reviews, but just had to for this fun and creative game. The artwork, storyline, extras...even within scenes the developers have put in some fun little extras in almost every one. Puzzles and HOS challenging enough but fun enough. Especially delightful if you are familiar with Alice in Wonderland characters. Rated 5 out of 5 by chris137 from Amazing! This is about the most perfect HO game I've ever played, and I started with BF in 2006. Very rich content, gorgeous graphics, super interesting HO scenes, even nice music. I was sad when I completed it! The developers really put their all into it. I definitely recommend this superb experience. Rated 5 out of 5 by lynnieann95 from Excellent All I can say is that I thorougherly enjoyed playing this game as the makers have taken the hidden object formula to the next level and instead of the same old, same old, the game play was more exciting with a different feel to it. The graphics are brilliant and the storyline, a good twist on Alice in Wonderland with no twee-ness to it. If I do have any critiscm then the morphing objects and collectibles were far too easy and also made easier when we are told how many collectibles we have to found on any page when it's more challenging when we don't know. Rated 5 out of 5 by Lime_Cordial from Loved it. Best game in a while Really enjoyed this game. It kept me engaged to the end. Rated 5 out of 5 by Dorathebluefish from Lots of fun! I haven't enjoyed a game as much in a long time. Was getting tired of "hidden objects" games because they basically always had the same storyline. Stopped buying them for a long time, then this one came out and played the free hour to see what it would be like. Enjoyed it so much, decided to buy it. The story is cute, the voices are very good, the hidden objects a lot of fun. Highly recommend this game to play on a dreary Sunday afternoon! Kept me on my toes throughout, made me laugh, just thoroughly enjoyed it! Rated 5 out of 5 by Kazikstan from A great addition to the Bridge to another world Loved the game, interesting, very good graphics, story, good fun. Rated 5 out of 5 by Janetto from Fabulous Game I thoroughly enjoyed playing this game, and it's probably one of the very best to come along in years!!! This was a refreshing take on a classic tale with beautiful graphics, a detailed map, and teriffic Hidden Object Scenes. Rated 5 out of 5 by nariiska from Not the bedtime story you were read Bravo this game is a true masterpiece from the storyline to the cut scenes to interaction with characters. The tasks minigames and much more take your breathe away and I actually felt like I was Alice trying to save them all. Normally I don't have music playing as I play but this time it added a final layer of depth and urgency to save wonderland/shadowland. This game is the next generation of pc games . Rated 5 out of 5 by gryhndlvr from Captivating game No need for me to describe the story etc. Everything was mentioned already. But I have to say this game kept me so interested that I could barely stop playing, although I am not done yet. I am not usually a big friend of fairy tales but this one has me totally sold. I love the twists, the actions, the story. It does not get boring. Very imaginative with good graphics a lot to do and to collect. This is well worth it. Rated 5 out of 5 by splash1234 from My favorite type of game!! Its great! A wonderful, imaginative, fantasy type game. So much fun. The graphics are great. Beautiful. Fun trying to find all the morphing objects. A fun feature I enjoy in these games. The story is great, even the music! Everyone has been telling about the story so I'm going to immerse myself back into my game. Loving it! Rated 5 out of 5 by Granny_Gruff from This Time It's Not Your Head You Need To Worry About! A refreshing twisted take on Alice in Wonderland transports you to Shadowland where the Princess of Hearts will capture your shadow and turn you into a mindless slave. You will have to elude the Princess' mechanical army directed by the Hatter and, not only get your own shadow back, but save the shadow slaves whose bodies are back in the human world in comas. Good stuff: A variety of HOPs and good mini-games, lots of interesting characters, gorgeous artwork creating an intriguing new world, a good story that is a twist on the classic, and CE bling. You'll have a few new tools - a charm that locates lost items after you complete a puzzle; a watch that lets your consciousness travel between your body and your shadow; and a magic bottle that entraps Jack who will cast spells for you when you find a piece of the bottle's seal. The music is really good and the songs sound specially written for the game and are also well done. (And I have NEVER before recommended the music in a game!) Bad stuff: Occasionally things get a bit dark, but that's all I've got, which is actually a good thing! I was really impressed with today's new game. Give it a try and you'll see why there are so many stellar reviews. Rated 5 out of 5 by ccurtis1 from Loved playing this Game GREAT GRAPHICS AND REALLY A FUN GAME TO PLAY WOULD LIKE TO SEE MORE GAME LIKE THIS. SOME OF THE GAME GET TO BE THE SAME, NICE CHANGE! Rated 5 out of 5 by gardenhawk70 from Based on the demo This is an interesting twist on the Alice in Wonderland story.Graphics were good. HOP gave you something relevant to game play and you don't run into them every time you turn around. Mini games weren't overly difficult. I like that the map shows collectibles and morphing objects. Overall a good game that I will be buying. Rated 5 out of 5 by dondynsmom from Loved it! I only played the free version of this game but I really enjoyed it! The story line is great! Making the creatures from Alice in wonderland people was brilliant, Keep the games coming!